Thanksgiving is, without a doubt, my favorite holiday. It's the one time of year I travel back down south (Birmingham, Alabama to be exact) to spend quality time with my grandmothers and other family members, enjoying good food and lots of laughs. While my Granny takes on the role of cooking the main meal, I bring my own special touch to the table by creating a fresh flower centerpiece. 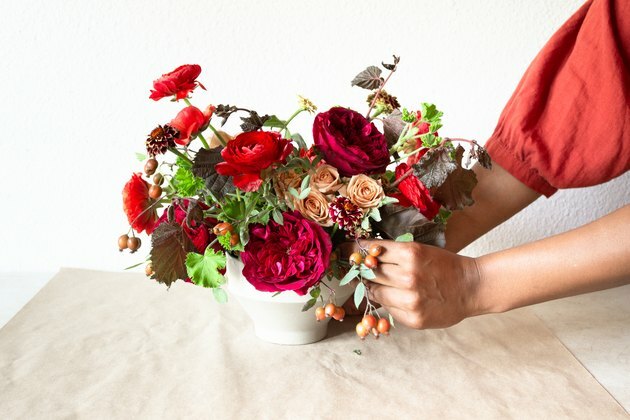 If you, too, want to add something personal to your Thanksgiving table, this easy-to-follow step-by-step tutorial will show you how to assemble a seasonally-inspired floral arrangement, full of rich colors and textures. 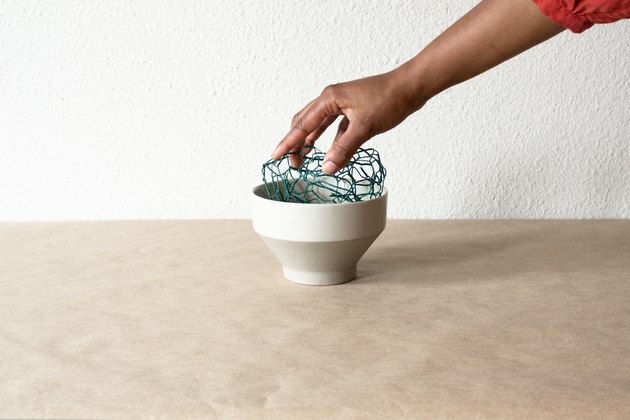 Prep your vase with a piece of chicken wire — this will support your stems as your create your arrangement. 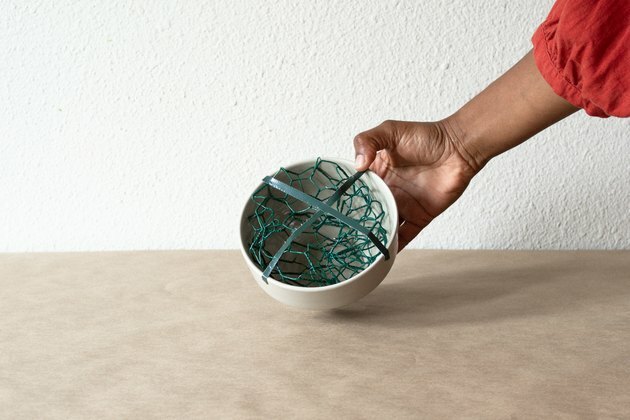 Gather the piece of chicken wire into a loose ball and place inside your vase. 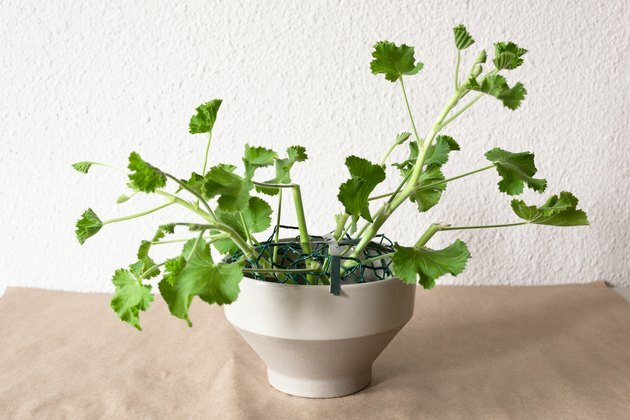 To keep the chicken wire in place, use two thin pieces of floral tape to create an "X" across the top, and then tape down to the side. Fill your vase with cold water. Next, add your greenery. 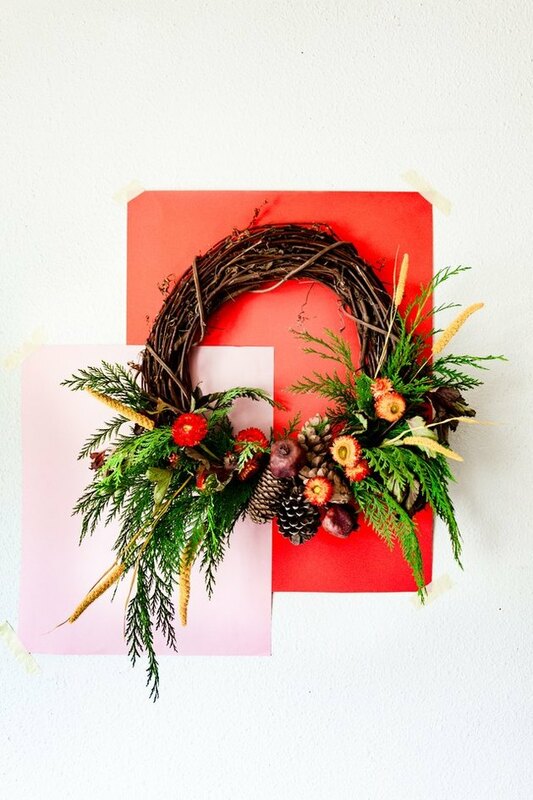 You'll want to create an outline of the shape you'd like for your arrangement. 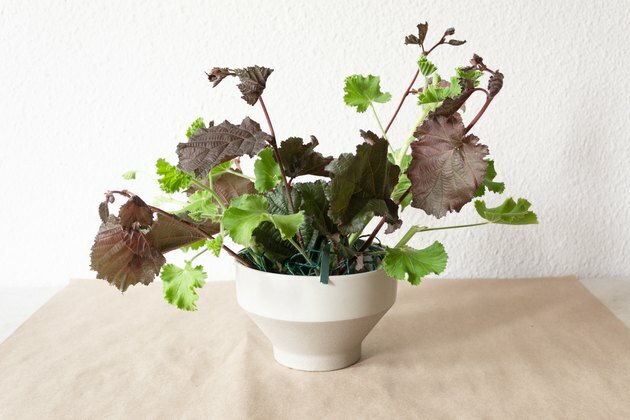 For this piece, I added my geranium leaves first, then followed the same shape with our darker ninebark stems. This creates richness and depth. 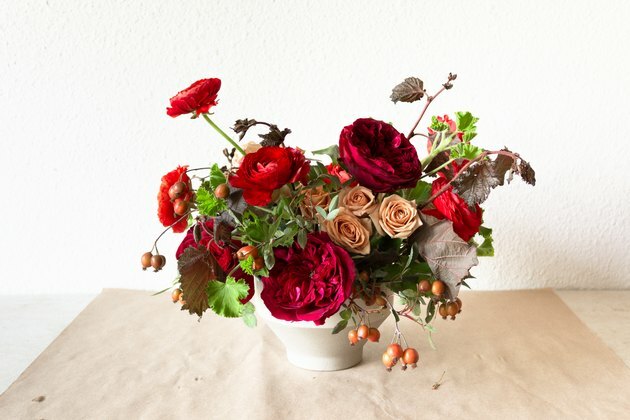 Now add your main focal flower throughout the arrangement. I chose a gorgeous, saturated garden rose variety named "Tess" in this example. For visual interest, add them at various heights and have at least one rose facing out in each direction. After the main focal flowers have been added, time to introduce the supporting flowers and bits. 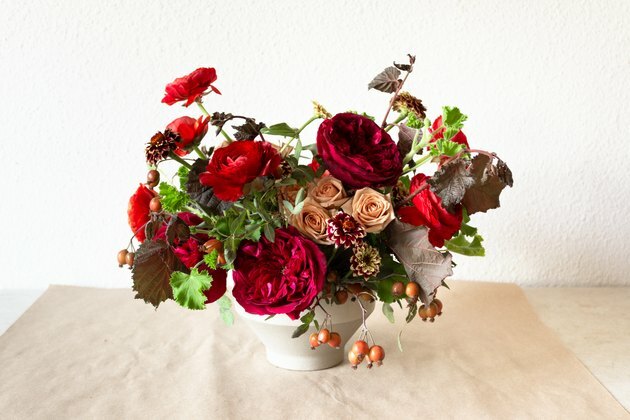 The supporting cast for this arrangement include spray roses in a beautiful camel color, rose hips, ruby red ranunculus, and "Persian Carpet" zinnias. Starting with the spray roses, add stems throughout the arrangement, focusing them mostly in the center. For the most central flowers, keep the stems short so that guests can see through the arrangement and enjoy the flowers on the other side as well. 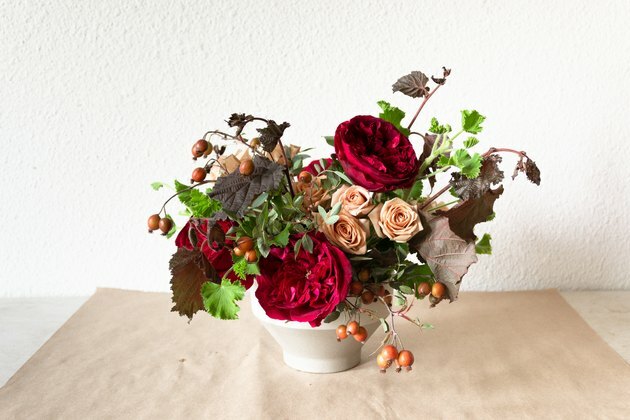 Next, add your rose hips — they add a really beautiful texture to centerpieces. Add longer stems to the sides of your arrangement to give it width, followed by shorter pieces along the front and back to create an abundant look. 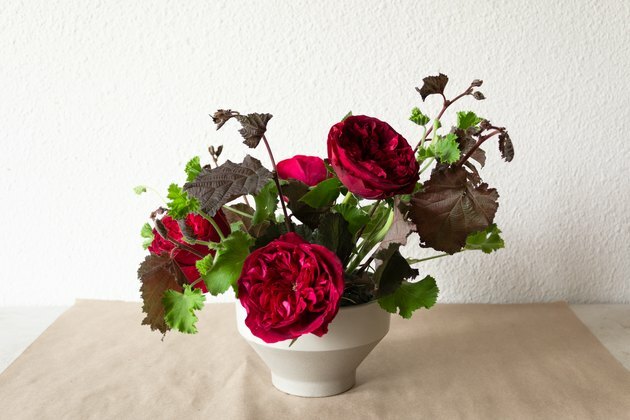 Then add your ranunculus. 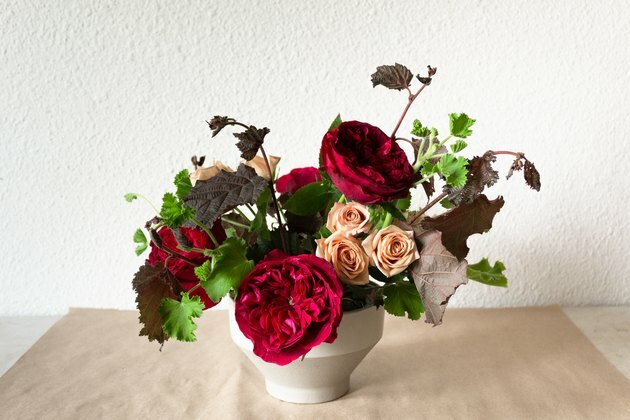 Ranunculus flowers add great movement to a centerpiece, so keep their stems long and add them in clusters for maximum impact. Follow up with your Persian Carpet zinnias, adding them in clusters at various heights throughout the arrangement. Finally, take a few more springs of rose hips and add them around the base to make sure your mechanics are all covered. Top off with a little more cold water and it's ready to be placed on your table. 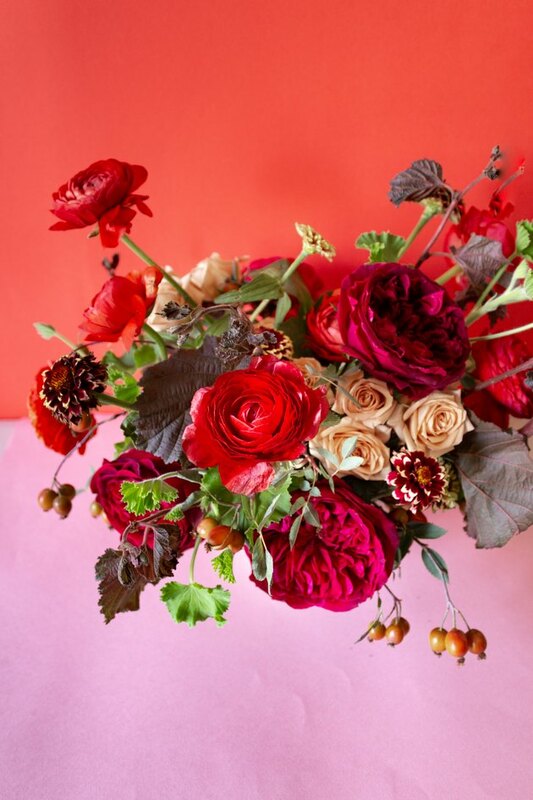 Whit McClure is the Creative Director of Whit Hazen, a floral design studio in Los Angeles, CA.